A photo safari into the adventures. 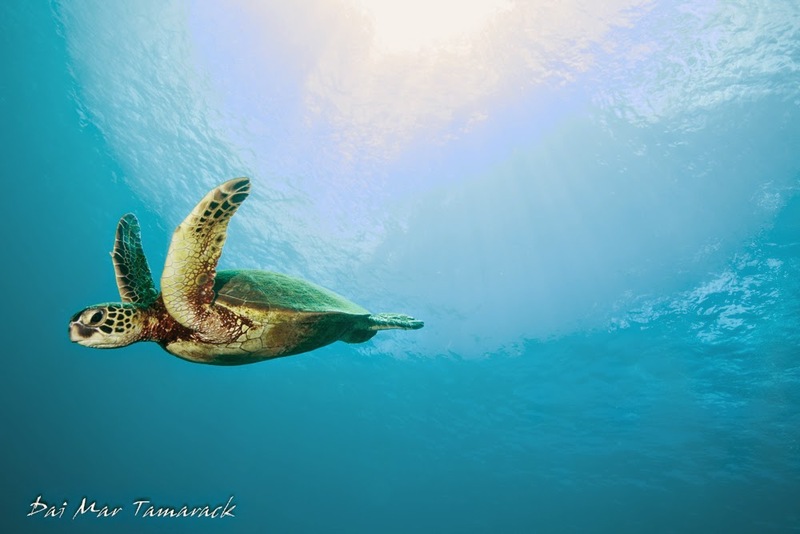 Summer time in Oahu means the North Shore calms down and scuba season opens up. 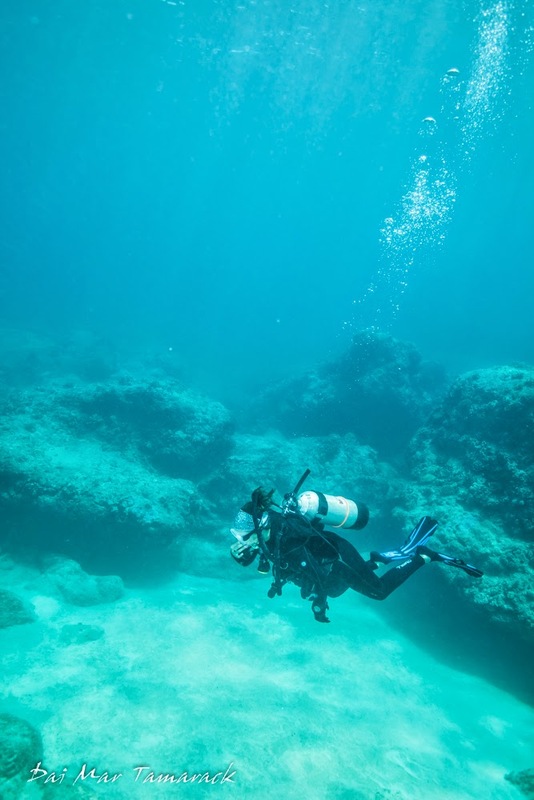 Heidi and I picked a very calm morning to rent some tanks and check out the underwater landscape at Shark's Cove, one of the North Shore's most popular scuba and snorkel sites. We snagged a couple of tanks from Eco Divers in the quirky North Shore town of Haleiwa. 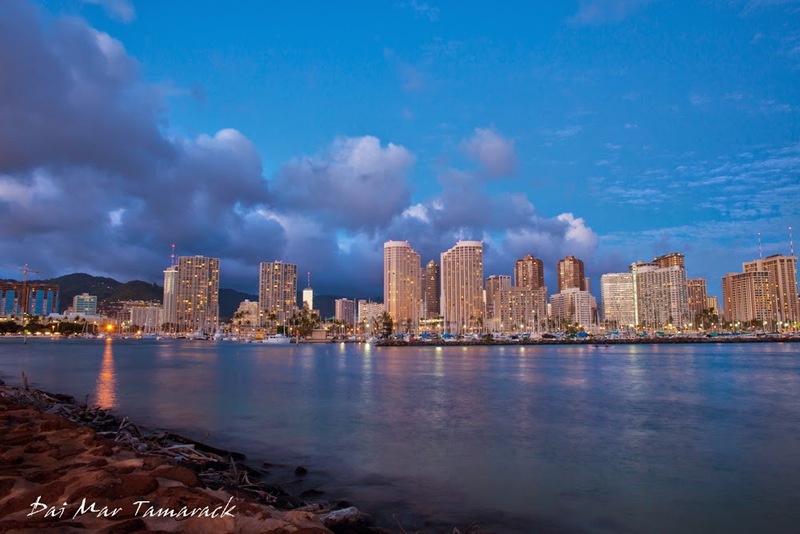 From there it is just a short drive to Pupukea, the community that contains shark's cove. It was a beautiful day and many people had already hit the water. Right when we got into the shallows I could see that it was going to be great viz for our dive. We started out by heading to the right but after not finding much and getting separated we decided to turn back to the left. The wall on the outside of the lave flow forms a vertical shelf that extends 20-30ft underwater. 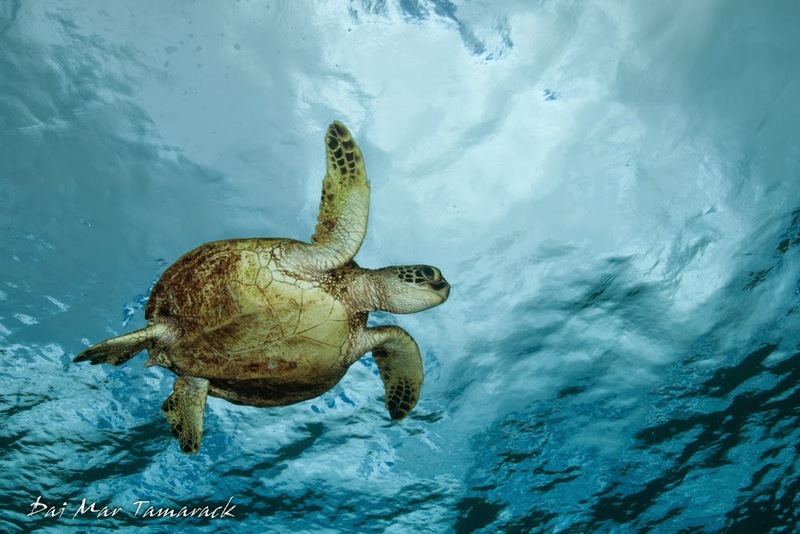 We swam past small schools of fish and a couple of fun nudibranchs but the best photo opportunities came from the feeding and swimming sea turtles. 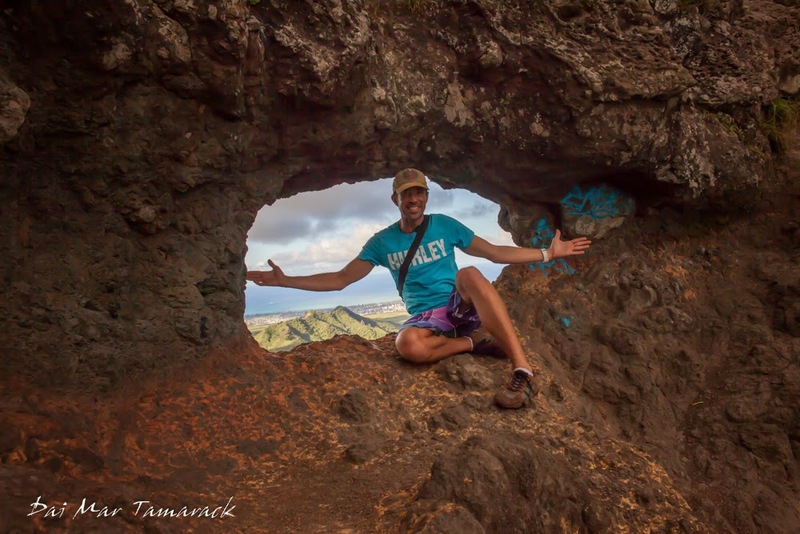 When researching secret hikes here in Oahu I stumbled upon a few stories about the Pali puka. 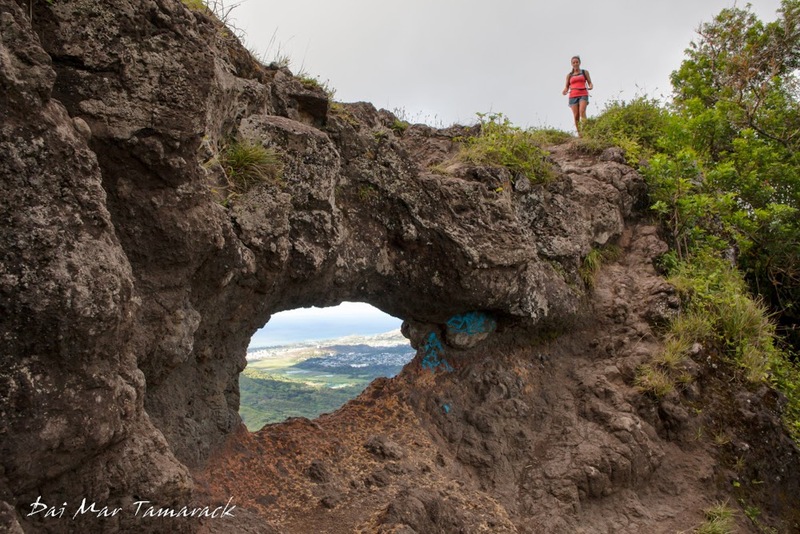 "Puka" is the Hawaiian word for 'hole'. 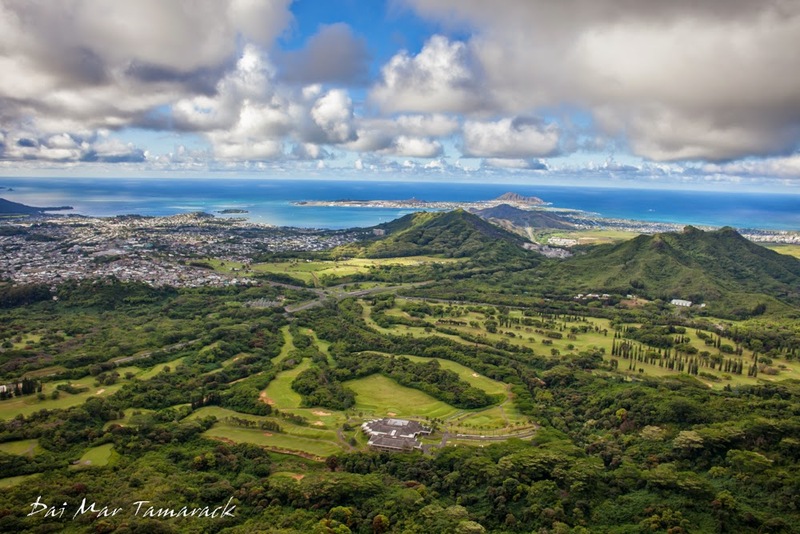 The Pali puka is a natural hole in the ridge near the Nuuanu Pali lookout. 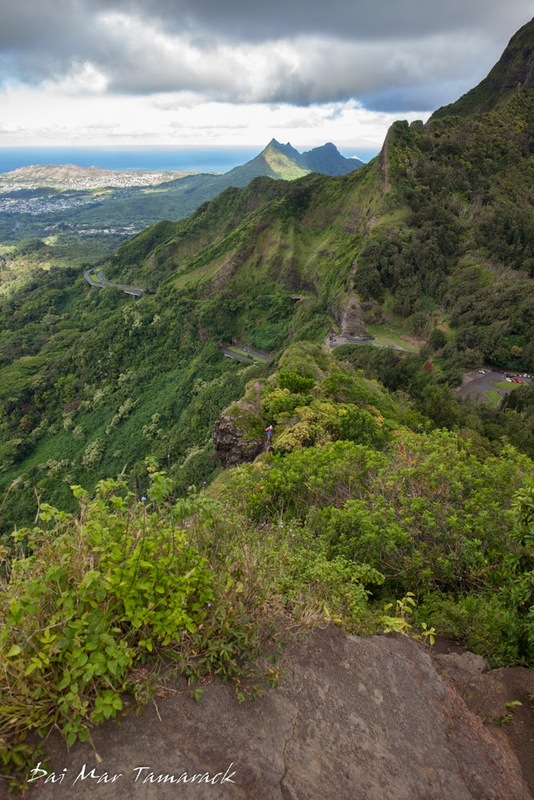 This lookout is the dividing point between the windward and the leeward side of Oahu. 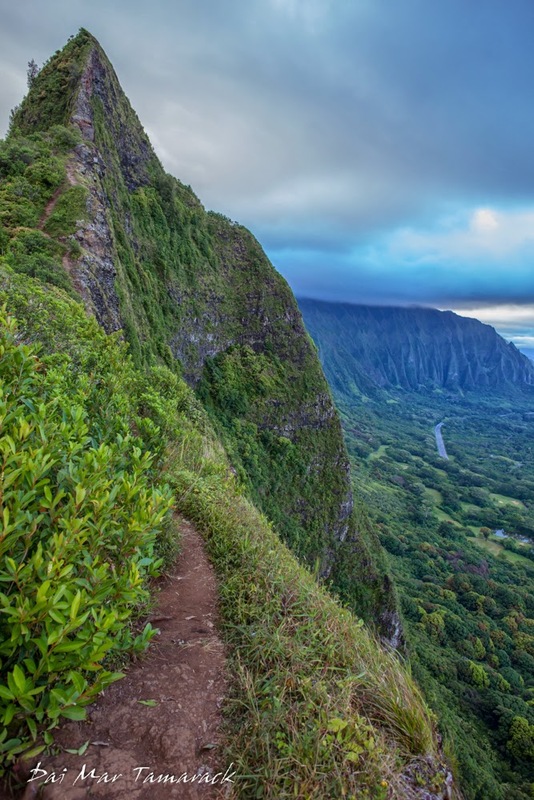 There is a low pass here in the Koolau range making it the traditional path for hikers crossing the cliffs. It also makes for a great starting point for a trail leading up to the ridge line, but it is not for the faint of heart. 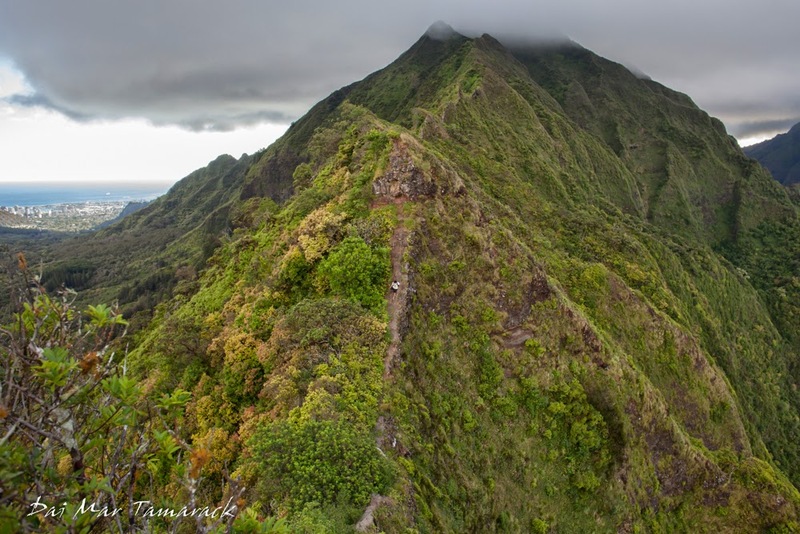 The ridge trail can lead all the way to Makapu'u on Oahu's eastern point or west to the fabled 'stairway to heaven', thousands of stairs leading up to an old abandoned coast guard station on the ridge. The puka lies along the ridge path to the west. If the trail is muddy my suggestion is to turn around. It gets very steep, and some parts of the trail bring you within inches of a thousand foot vertical cliff face. Luckily the strong wind that is a constant along these cliffs blows you away from the precipice. This is reassuring until you reach the points where the trail becomes a knife's edge, and you find yourself skirting the precipice on both sides! The view along the trail is worth all of the bottled up fear. 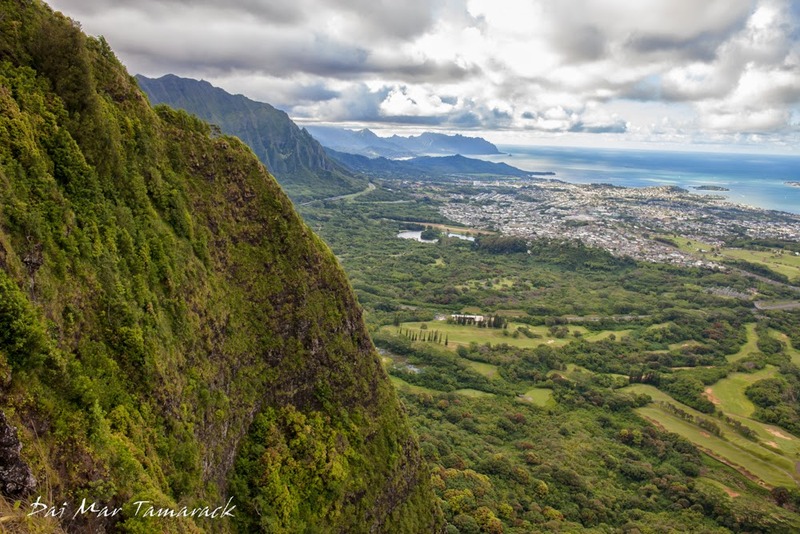 Kaneohe Bay sparkles in light blue reflections and the very lush windward coast spans out into distant ridge lines. The sheer vertical cliffs stand in stark contrast to the sloping valleys and ridges of the leeward side. 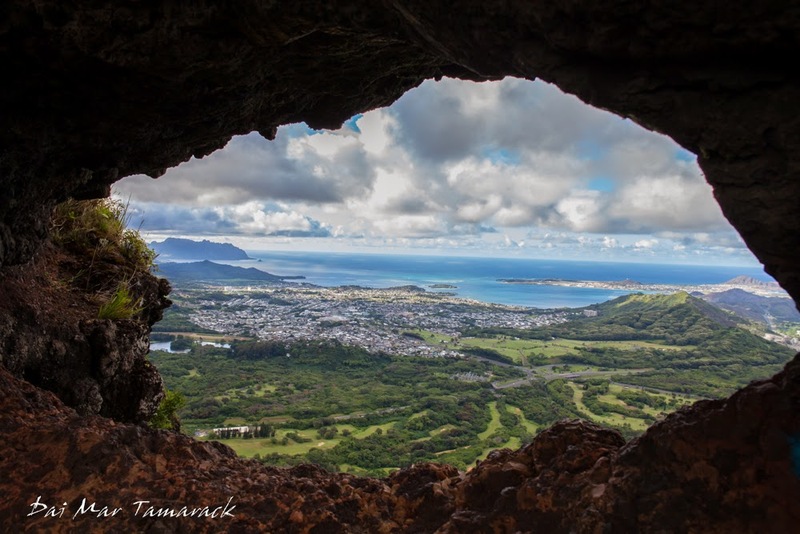 The puka itself is like a window to the windward side. It would be impossible to look through it towards the leeward side without the power of flight or perhaps dangling a thousand feet up on some very sturdy ropes. 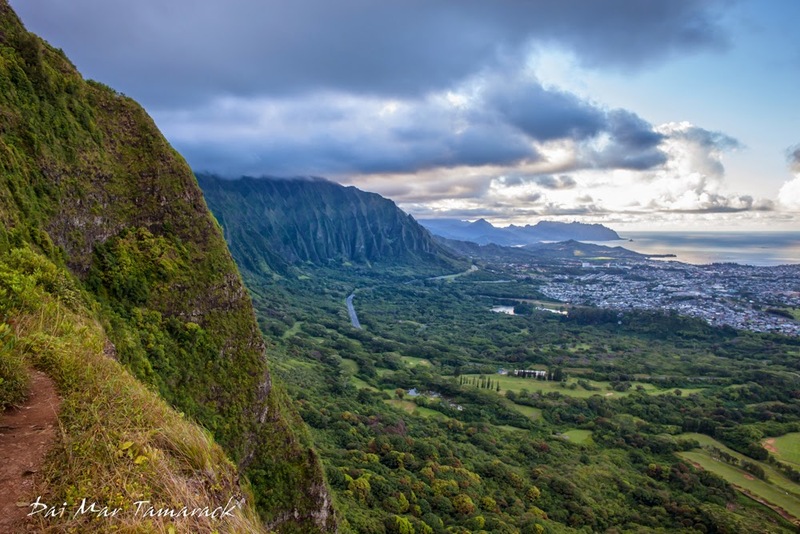 I was happy to have checked another one of Oahu's secrets off my list, but my curiosity once again got the better of me and I decided to trek on to see what was around the next bend. After the puka the trail dips down just a bit into the shade of the first knife-like peak seen below. A few handily placed lines help me past some eroded parts of the trail before I come to the end of the trail...or so I thought at first glance. After a quick scan up I find to my enjoyment that the trail here go up a 65 or 70 degree incline marked by different lines dangling from trees far above. Without the lines helping me up I never would have made it. It was a tremendous upper body workout, but I didn't realize until the next day what a thigh burner it would be as well. As I summited past the knife peak I could see for the first time the ridge line trail heading west along the different peaks off into the clouds. Someday I will be back to go the distance. But the setting sun and dinner cut my time short. I think I will sleep well tonight. When a gallon of milk cost $6 and gas is upwards of $5 people start to look for cheap night out opportunities. 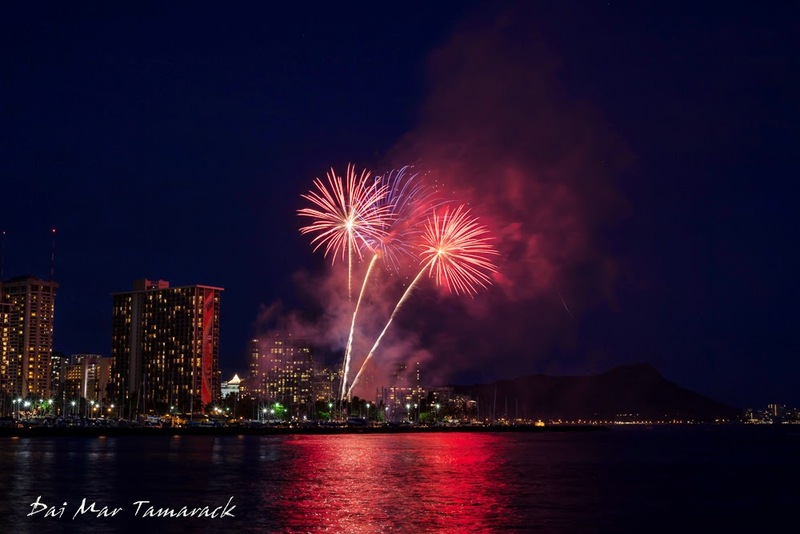 The entertainment here in Waikiki is usually quite pricey but every Friday night after sunset the Hilton has a pretty decent firework show at the far end of Waikiki beach...for free! 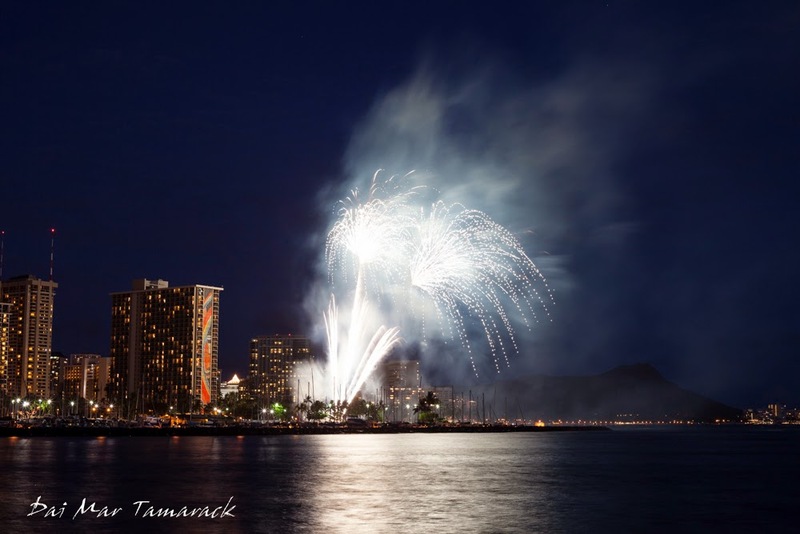 So grab a maitai, find some beach space, and set those cameras on long exposure to capture all the action. 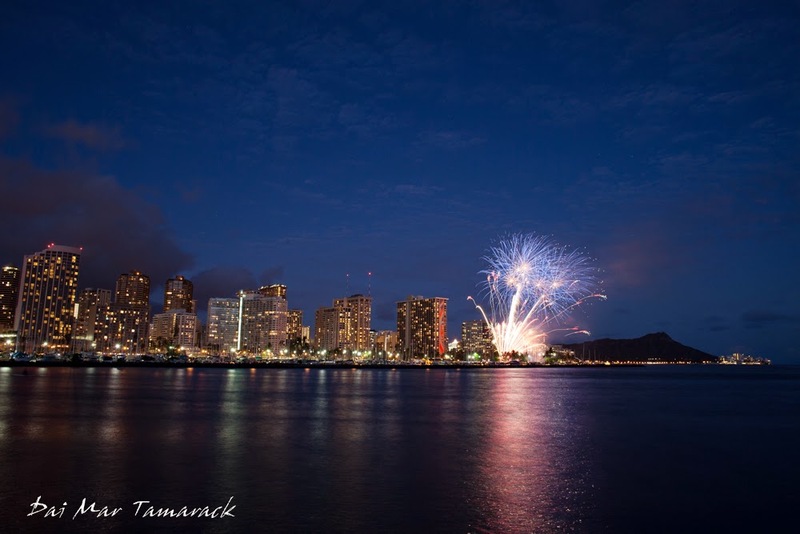 I ran an around the island tour which finished just before sunset so I thought I would check out the fireworks after. 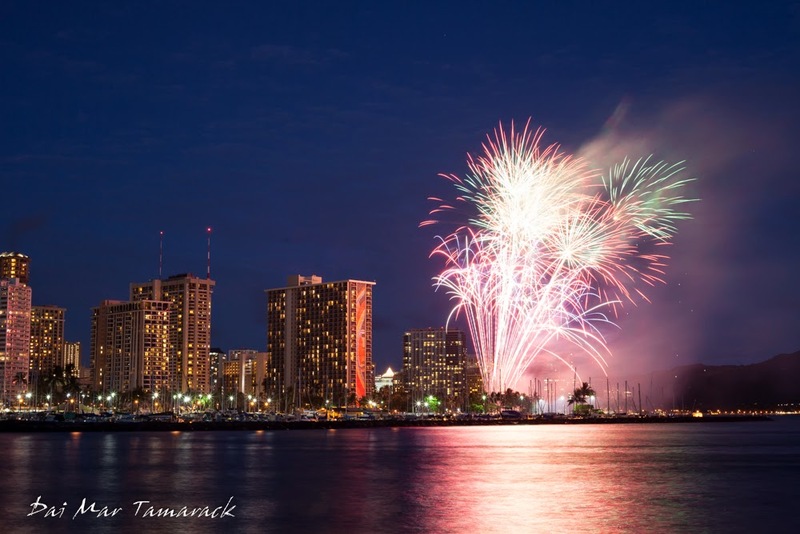 I parked at Ala Moana mall and walked across the street to the beach park, figuring it would be a good vantage point to photograph the fireworks over Waikiki. It turns out I wasn't the only one with this idea. Tons of local families had tents and bbqs set up with good views across the harbor. Other photographers already had their spots staked out and tripods set up. The fireworks only last for about five minutes, but it is still an impressive display. It is pretty unbelievable that the Hilton does this every Friday. 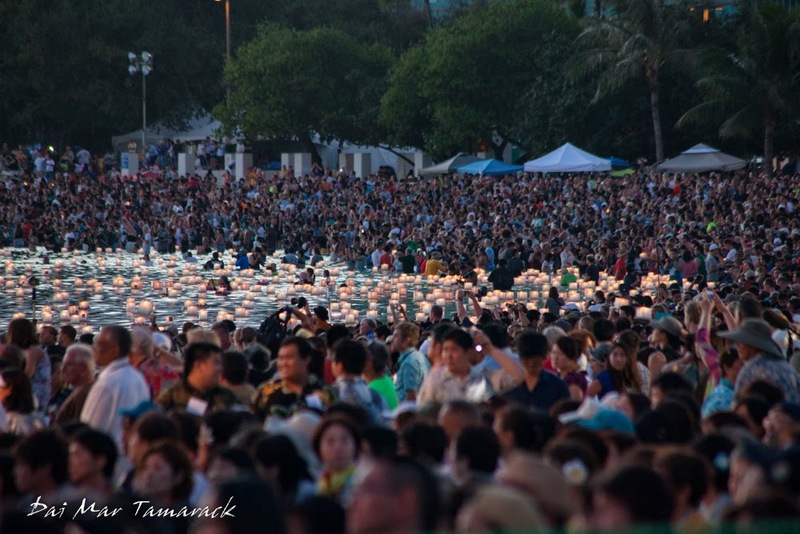 40,000 people gathered in Ala Moana Beach park this memorial day for one of the most moving and peaceful celebrations I have ever witnessed. 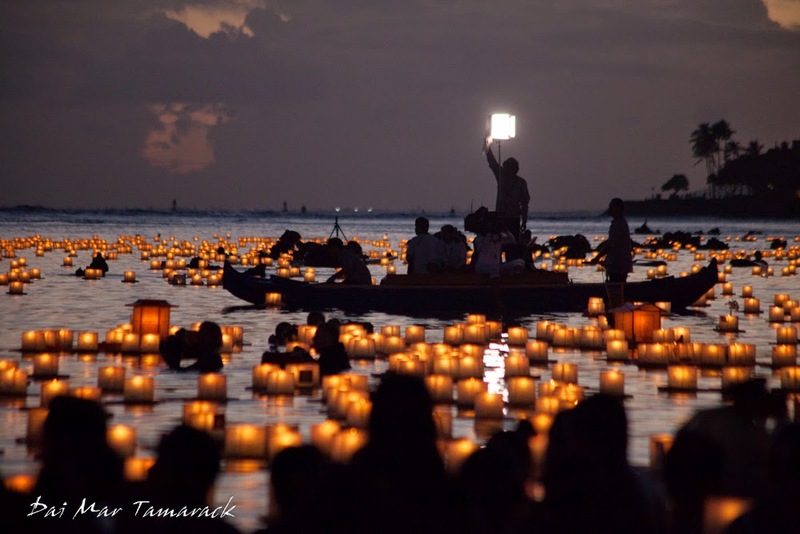 The Lantern Floating festival here in Oahu, HI has become a major attraction. 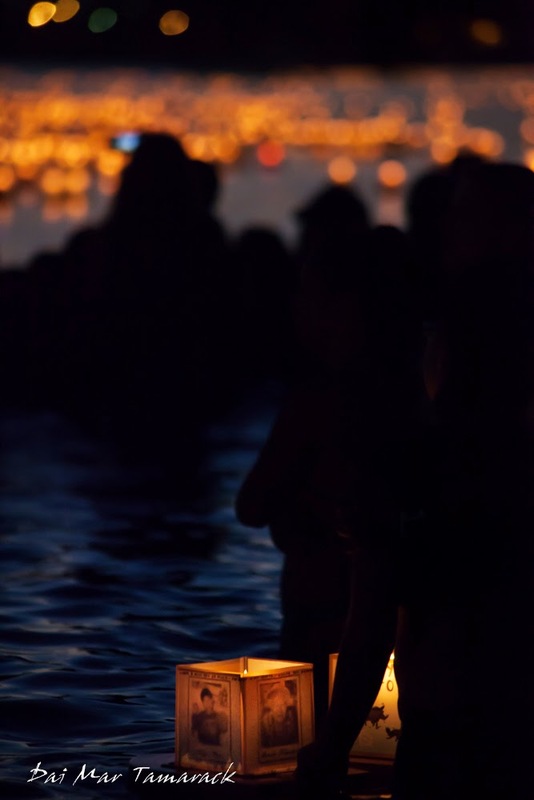 Over 6,000 paper lanterns were created and then just after sunset people made their way down to the water where they set their lanterns afloat. 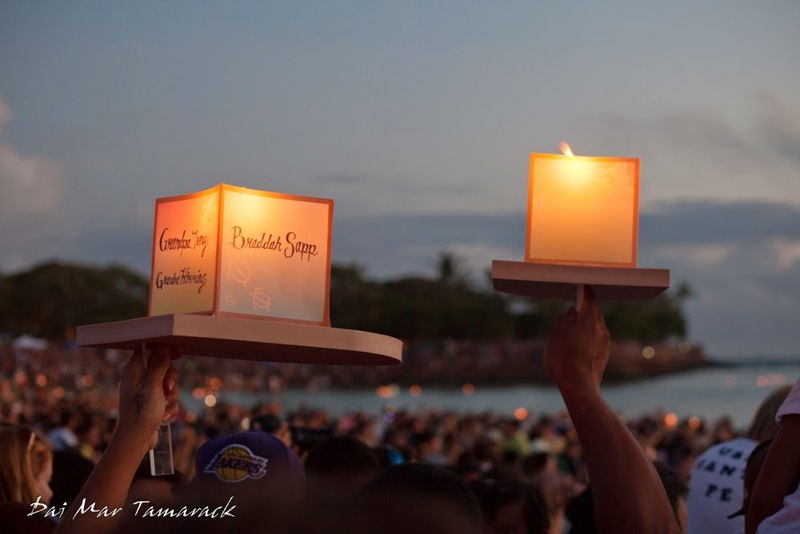 The lanterns were covered with the names of lost loved ones; grandparents, parents, siblings, friends, even pets. Messages to the deceased filled the empty spaces on the lanterns. Not wanting to litter the ocean with debris, even degradable debris, all the lanterns were corralled at the mouth of the bay. 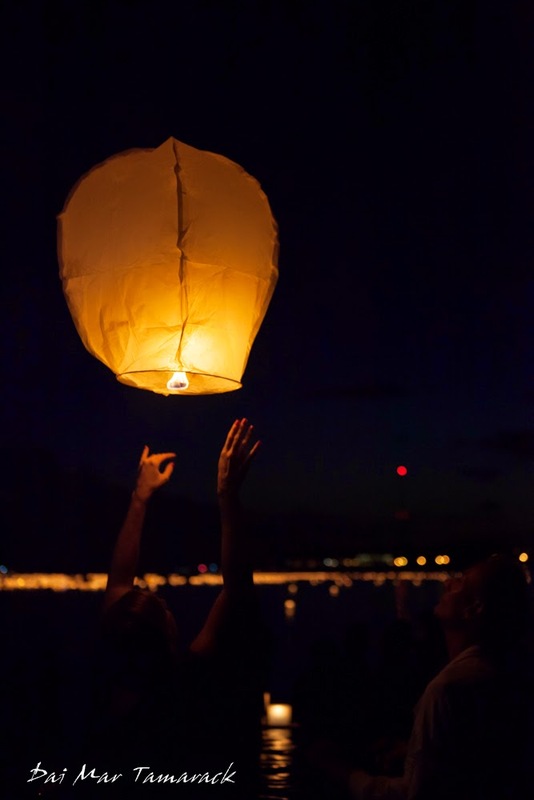 The floating lanterns of the flying kind were outlawed, although I saw a few lifting off after most people had already finished and turned towards the parking lots. 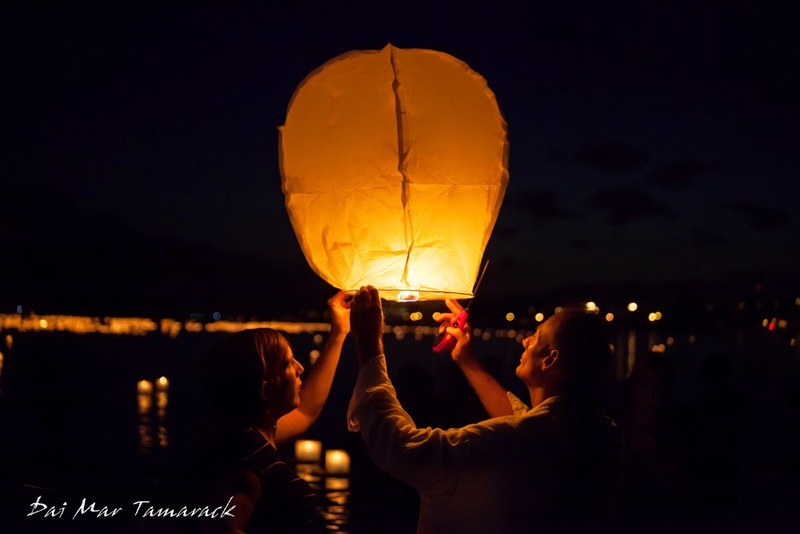 One of my favorite images of the night was two people lighting up one of these flying lanterns and watching the concentration as their faces were lit up only by the lantern. I was unprepared for the sheer amount of people that showed up and the massive stage and presentation that preceded the actual floating of lanterns. I was also amazed by the calmness and closeness that a gathering this large could emanate. It is human nature to veer towards the mob mentality when in huge groups. It is nice to see that it is not always the case. Running into friends on the beach was also a huge surprise with the size of the crowd. If you ever happen to be in Oahu during memorial day, this is a can't miss. 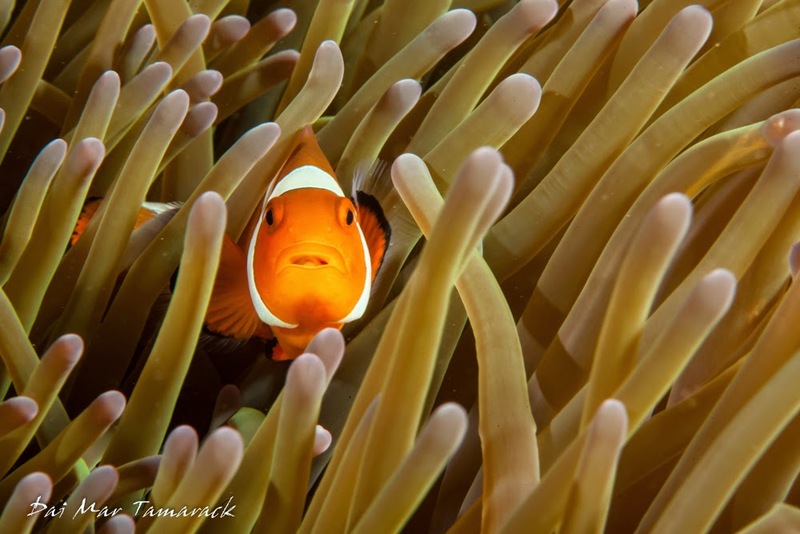 Anemonefish, or clownfish as they are widely known, are some of my favorite photographic subjects. Not only are they brightly and boldly colored, but you are almost guaranteed a surreal background. 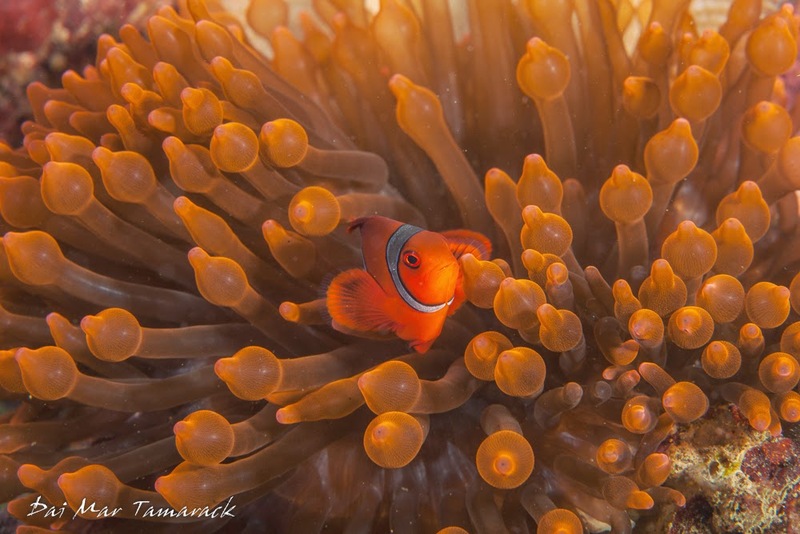 These fish are almost always found darting in and out of their host anemone, which provides a protective home for the anemonefish. 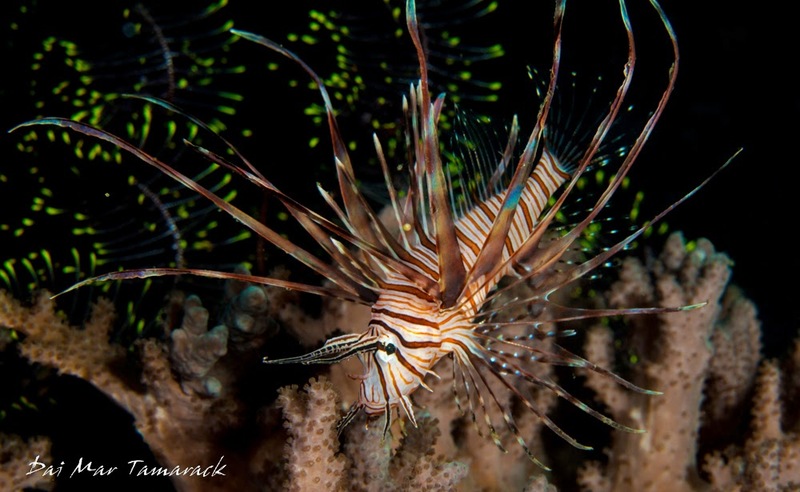 These fish have always been a favorite of scuba divers and underwater photographers, but have gained a worldwide reputation since being featured as "Nemo" in the Finding Nemo movie. With fame comes problems. 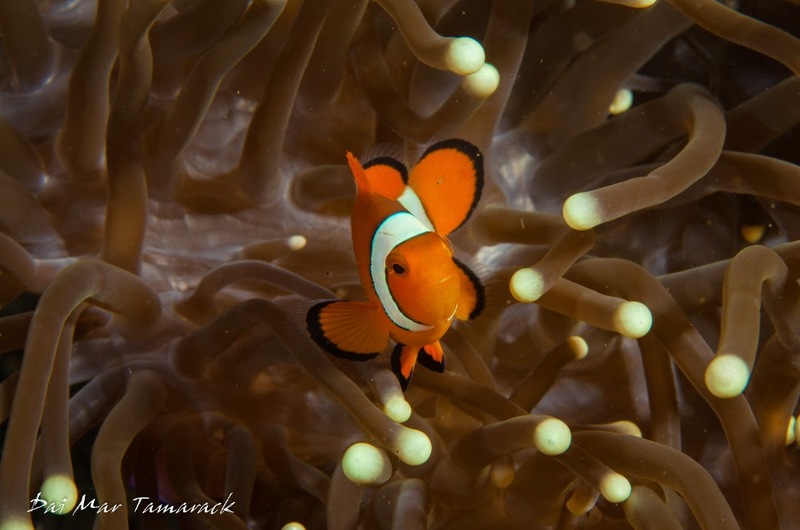 The demand for anemonefish in the aquarium trade has increased exponentially, an ironic fact since the movie's message preached the exact opposite. 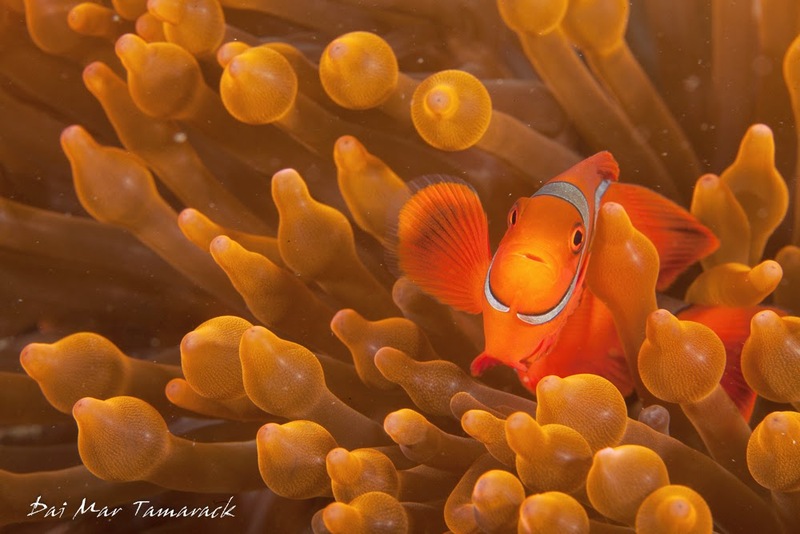 The mutualism between anemonefish and their host anemone has been widely studied but is still not fully understood. Just how the fish are able to avoid the potent poison of the anemone is only theories at this point. 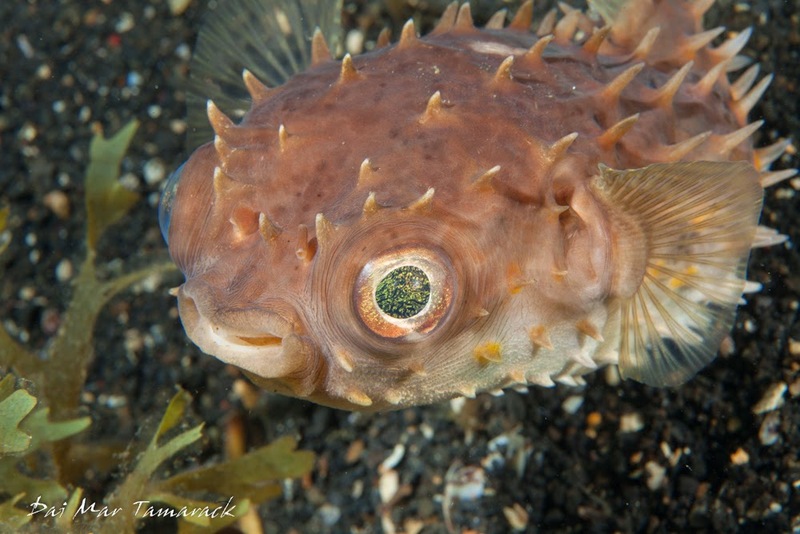 It could be the fish's mucus coating, or the fish may have co-evolved with a specific species of anemone becoming immune to the toxin. There are many benefits to the relationship that have been proved. The anemone can protect against the fish's predators, while the fish can take care of pesky parasites that would invade the anemone. 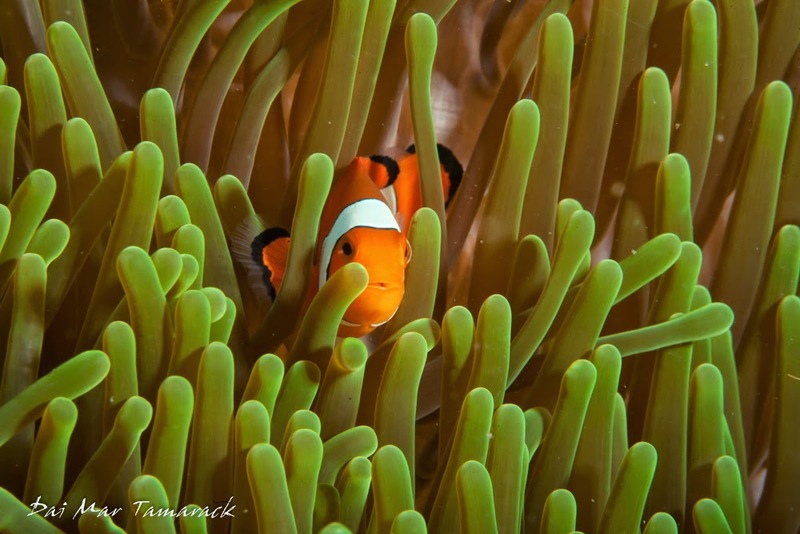 The anemone also provides a safe nesting place for baby anemonefish like Nemo to grow up. 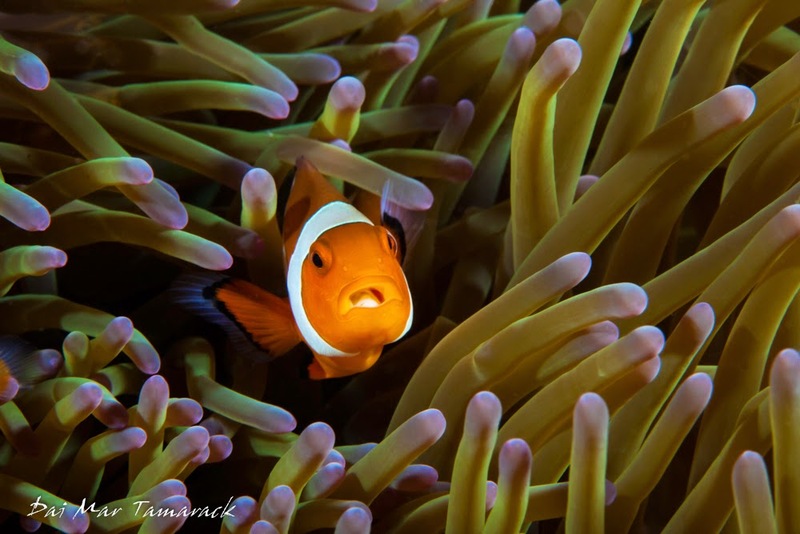 The anemone can also pick up extra nutrients from the clownfish's excrement. 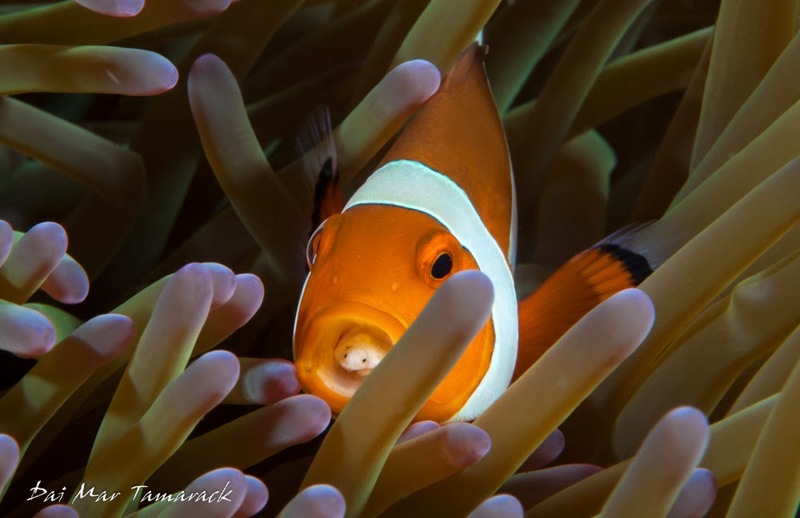 Anemonefish live in shallow protected tropical reefs and lagoons. 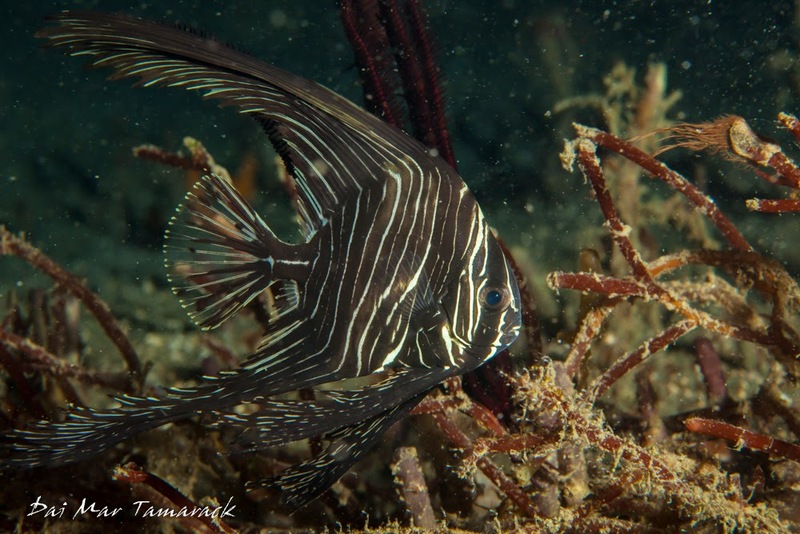 Since they are often in shallow water it is usually towards the end of the dive that I have time to search out and photograph these beautiful fish. 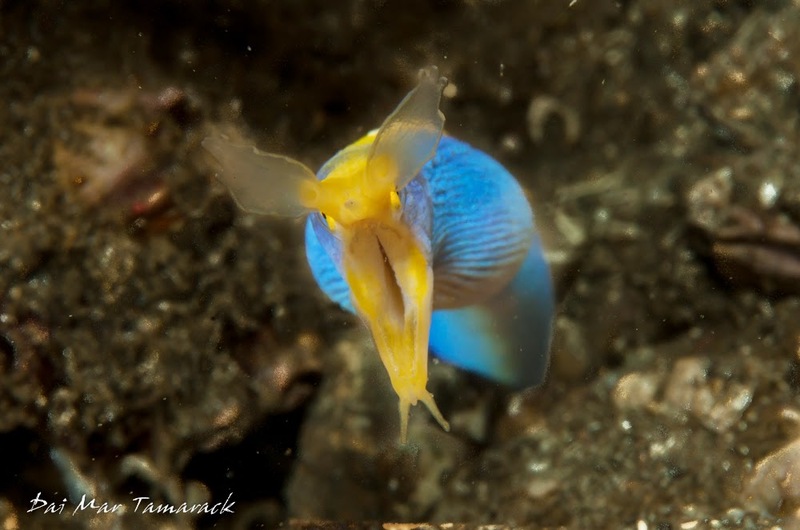 On one occasion here in Lembeh, I found one anemonefish that was acting a bit strange. They are often defensive of their homes and will dart out at the camera. However this one was hanging back, tucked within the neon tentacles of the anemone, while holding its mouth open. After closer inspection I noticed a parasite had entered the fish's mouth, eaten, and then replaced the tongue of the fish. Two beady little eyes peered out from the open mouth cavity. It was very interesting to see an example of parasitism in the middle of one of the most famous forms of mutualism. 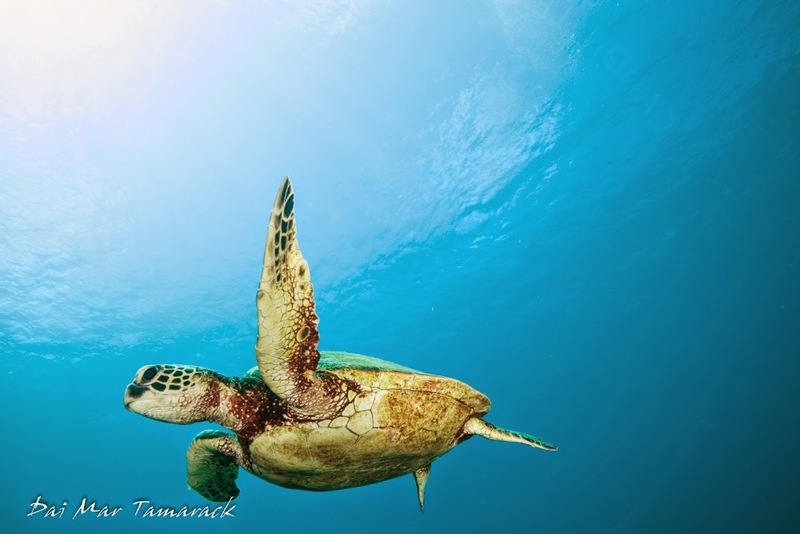 Take a walk, or swim, on the wild side. 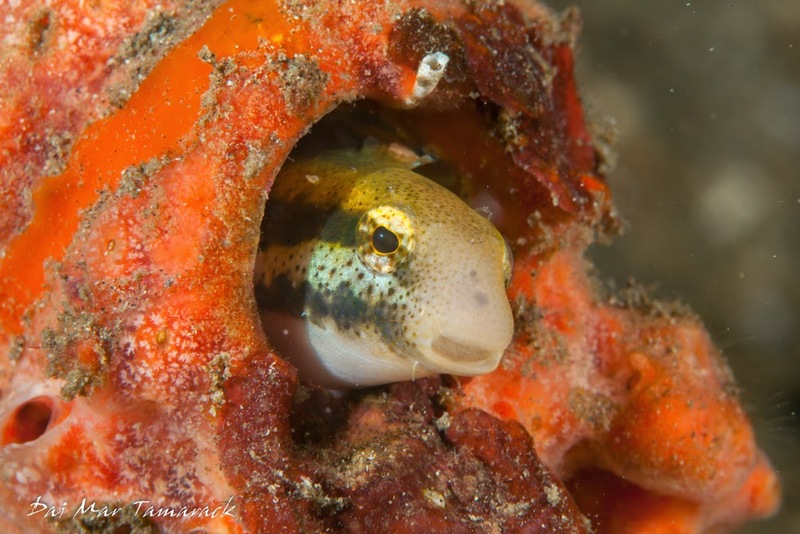 Bizarre fish pop up on every dive here in the Lembeh Strait, Indonesia. 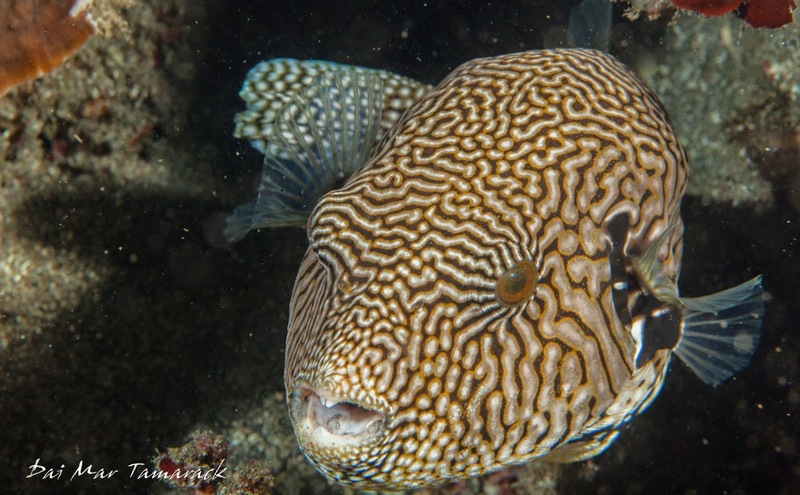 While staying and diving out of NAD Lembeh resort and with the help of our amazing critter finder and guide Nathan we saw a plethora of fun fish. Here is a sample of the craziness. 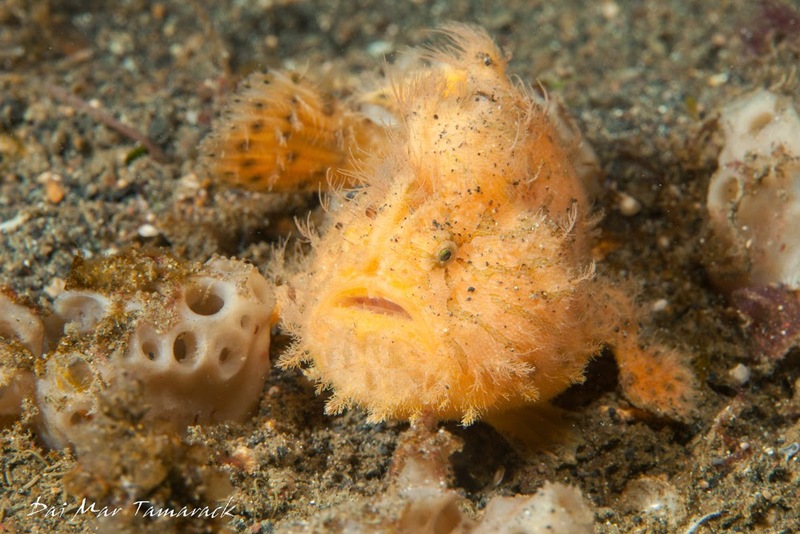 Frogfish are some of my favorite fish to look for. 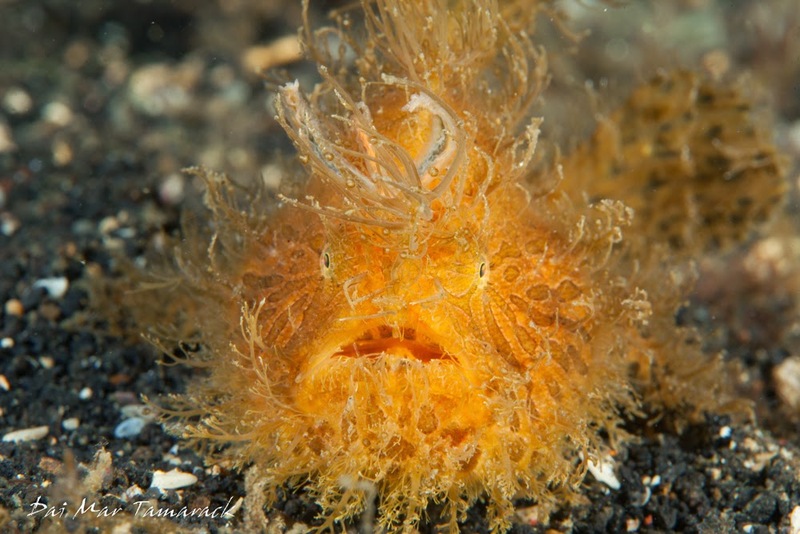 I can find a few species in Hawaii but for the rare hairy frogfish, Lembeh is the place to look. 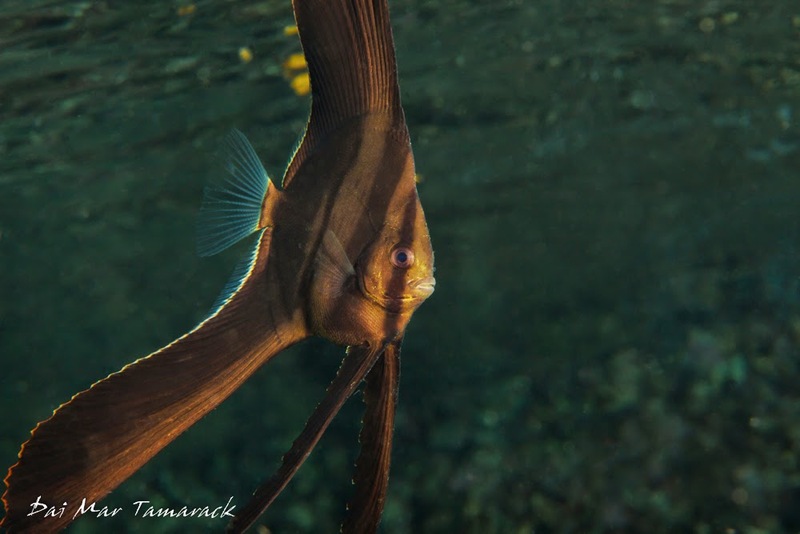 We were lucky enough to find two of these bizarre looking fish during our stay. Both were moving along the black sand and bobbing their lures up and down trying to trick prey into coming close enough to gobble up. Their mouth extends forward enabling them to swallow prey nearly as large as they are. Another big mission this trip was to find a blue ribbon eel. The adult males are blue, while the adult females are yellow. 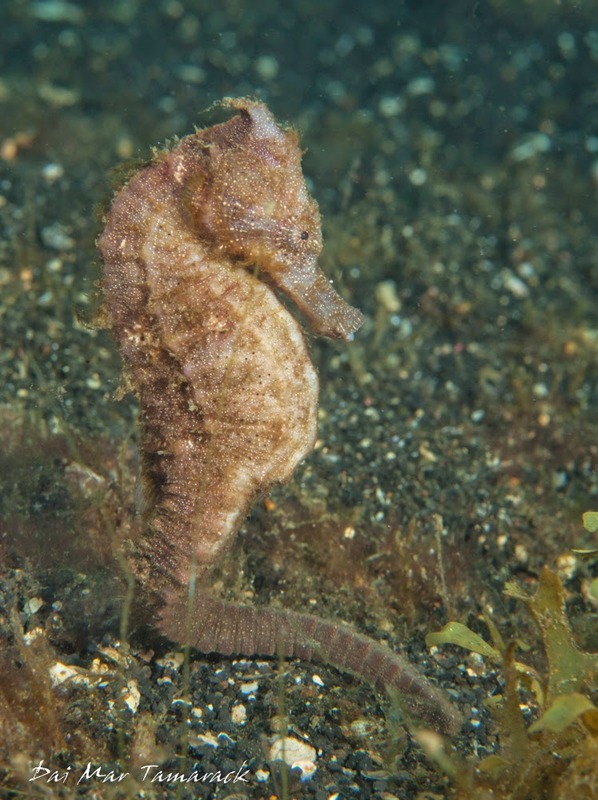 Juveniles are black and for a long time were classified as a different species. They resemble an ancient Chinese dragon with a long thin body and high dorsal fins. 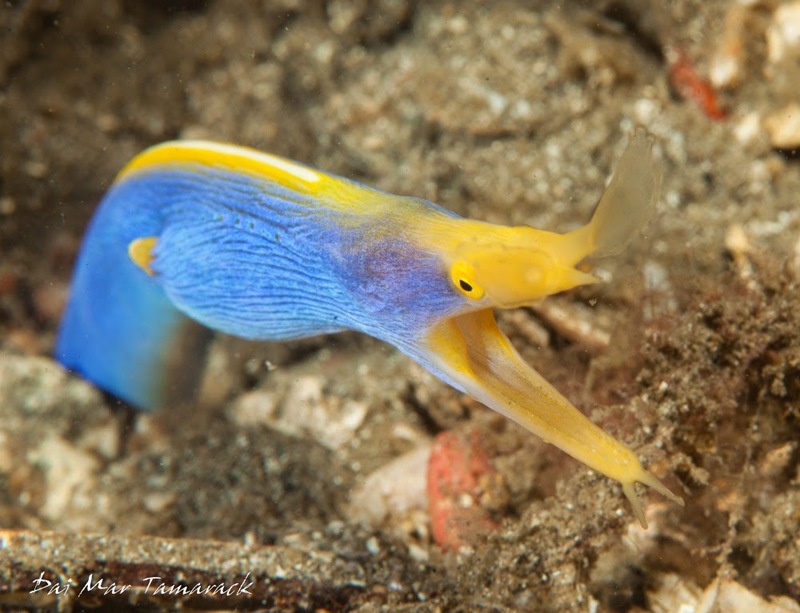 We ended seeing four or five of these blue ribbon eels, Rhinomuraena quaesita, making Lembeh the top place for them so far. 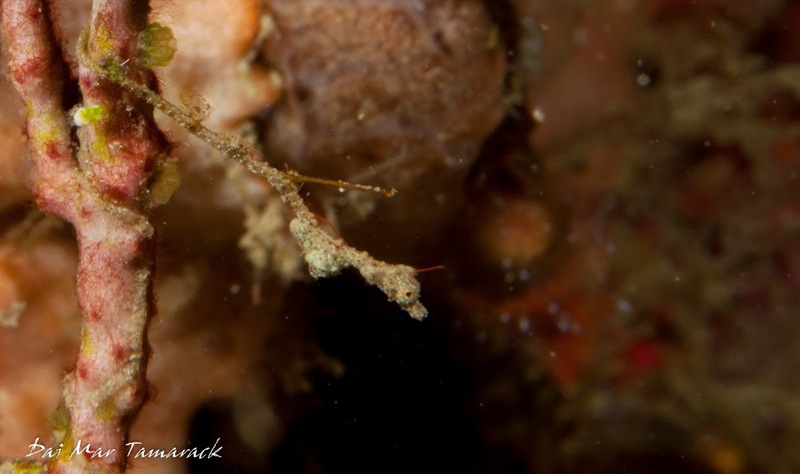 One family of fish to keep an eye out for while muck diving in Indonesia are sea horses and pipefish. 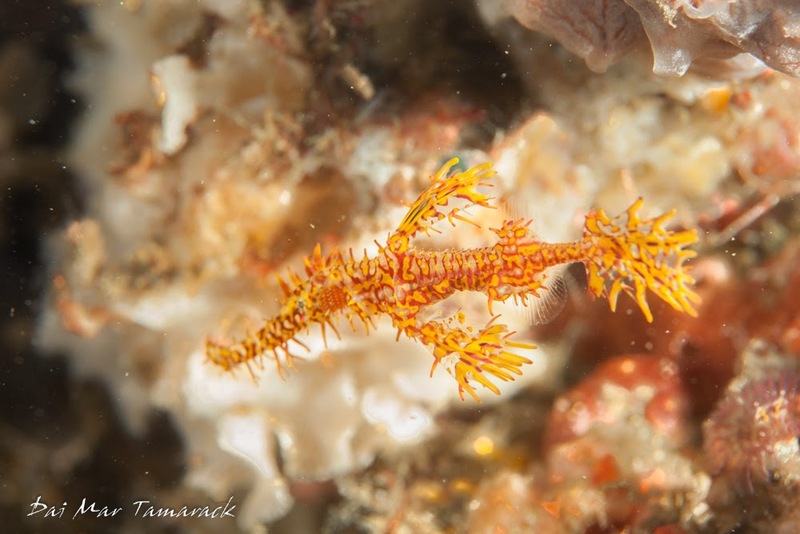 There are many different species from Thorny Seahorses to tiny camouflaged pygmy sea horses, to the newly discovered Lembeh Sea Dragon, to wild colored Ornate Pipefish. 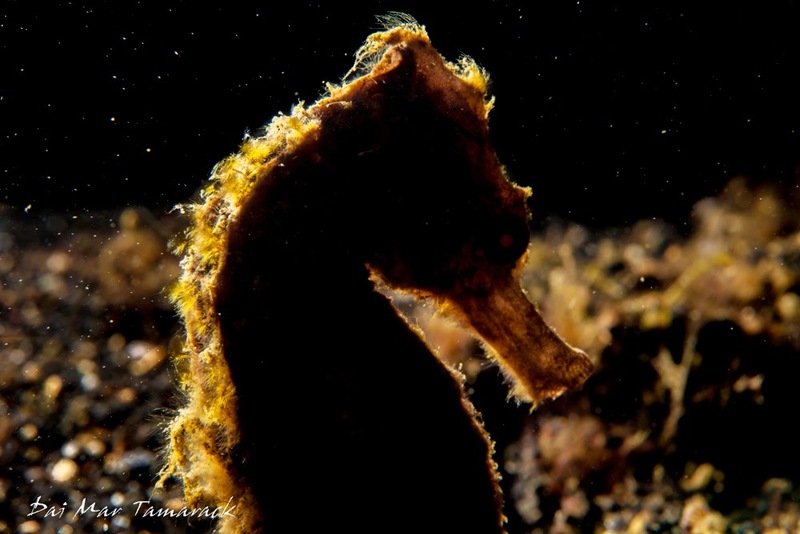 Because of the number of species you can encounter it is possible to find sea horses or pipefish in any environment in the Lembeh Strait. 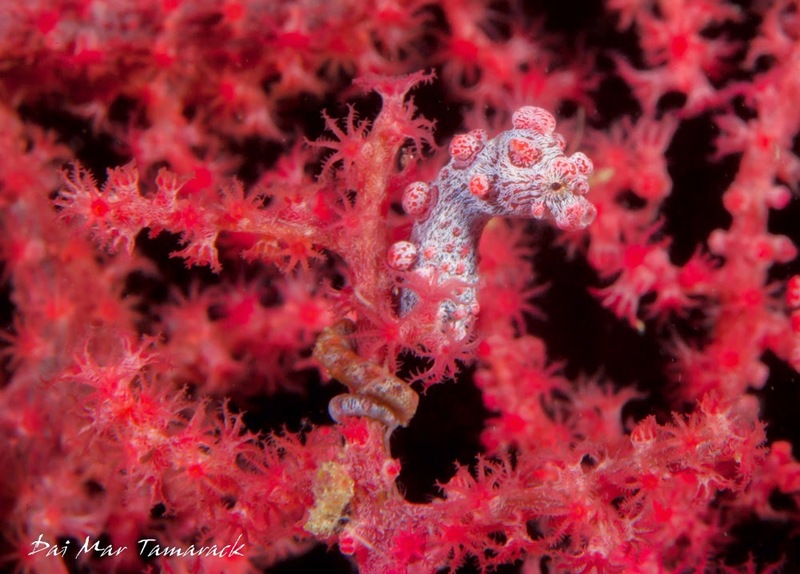 But it does take a highly trained eye to find some of the smaller species like the Lembeh sea dragon and pygmy sea horses. 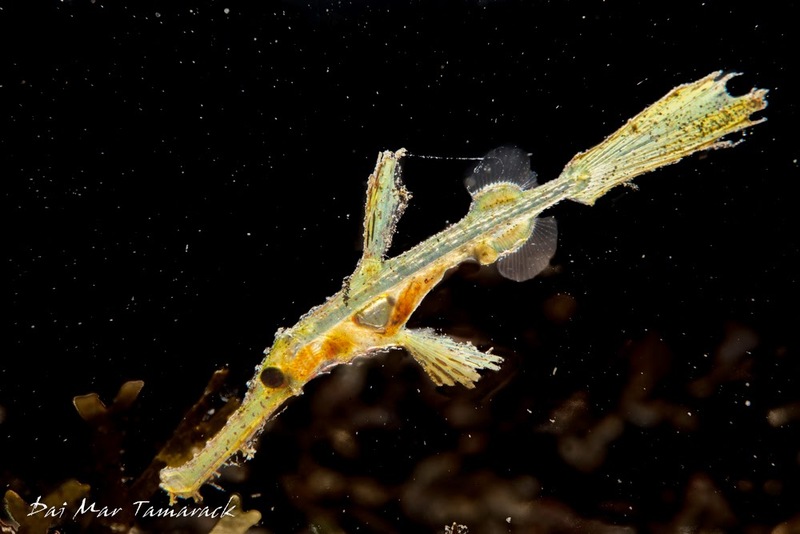 The Lembeh Seadragon (Lembeh Pygmy Pipedragon, Kyonemichthys rumengani) is a recently dicovered species that has been seen for the first time in Lembeh Strait in 2006. 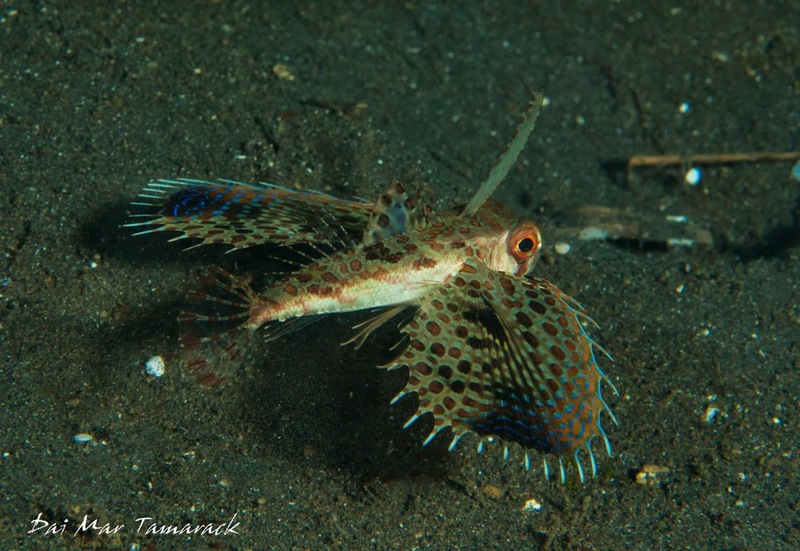 There are fish here in Lembeh that you might not recognize as fish. But even the somewhat recognizable fish are out of this world. 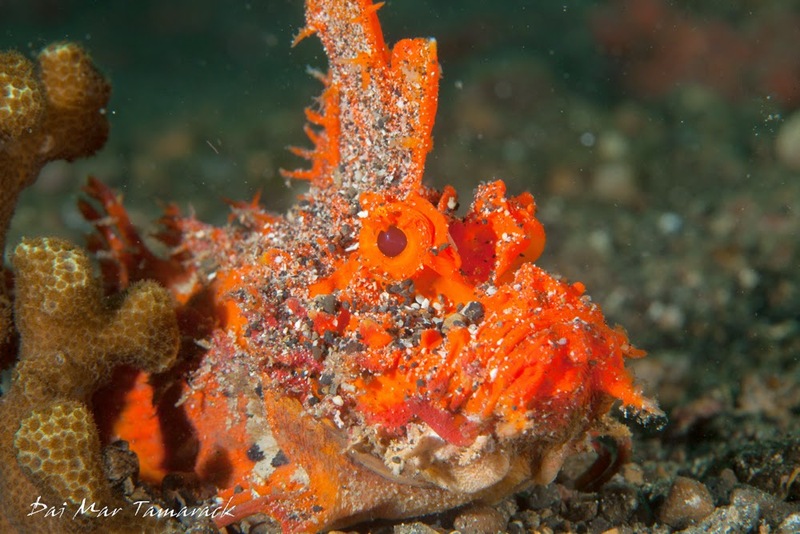 Ambon scorpionfish and flying gurnards walk across the sandy bottom, clownfish dart in and out of their beautiful anemone homes, and juvenile batfish trail behind huge fins compared to their bodies.